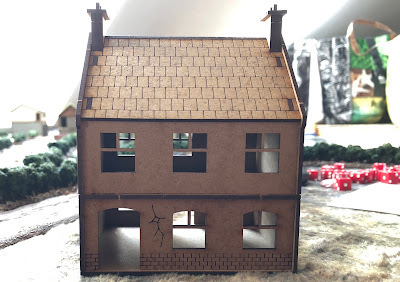 Almost 10 years ago I put together a post called A Question of Scale in which I lamented the difficulty of assessing the size of buildings before buying them. 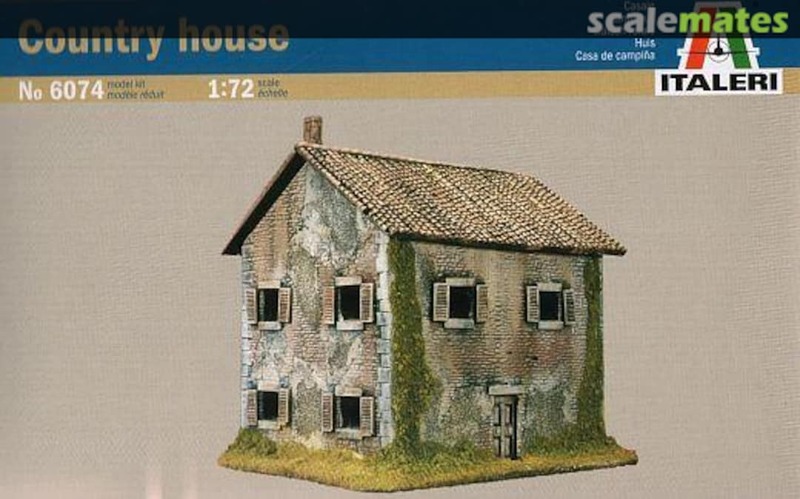 At the time I was looking at 15mm buildings for my 28mm Napoleonic large battles. What I found was that what was advertised had absolutely nothing to do with actual size. Over the last several years, as well documented in this blog, I have gone heavily into WWII skirmish gaming. A big requirement of this is buildings, especially in Western Europe. With my scale I have a choice of two scales which should be fairly close 1/72 and 20mm (1/76). I generally have 20 mm figures with the occasional 1/72 thrown in. I initially bought the Italeri 1/72 scale buildings which are made of hard plastic and are quite nice. Limited selection though with 3 Houses, 1 Railroad Station and 1 Church. These buildings are on the large side and the Railroad Station and Church are I think out of scale while one of the Houses is really trashy. The Country House with Porch and the Country House are quite nice and scale well with the 4ground 20mm World at War MDF collection. I have to say though that as you will see below their Café Grondeé is really out of scale with the buildings in the Farm Complex Selection. 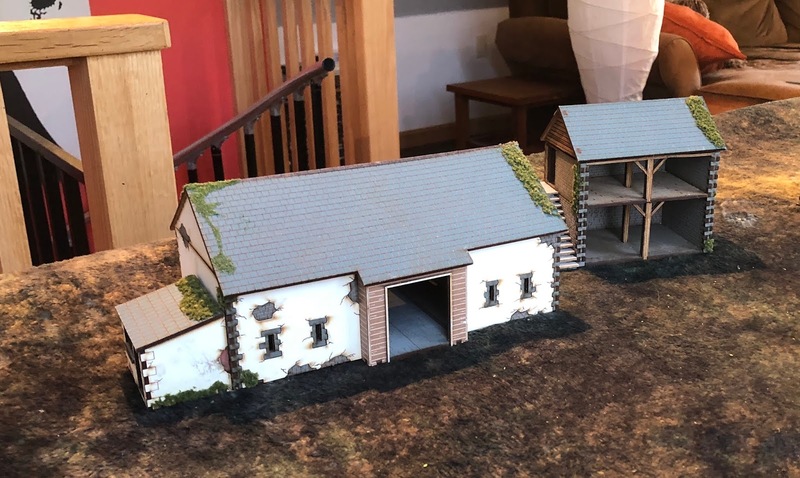 The 4ground Farm Complex is at least 1/72 scale if not larger. I then went and bought the PlastCraft Games 15-20mm EWAR Collection. 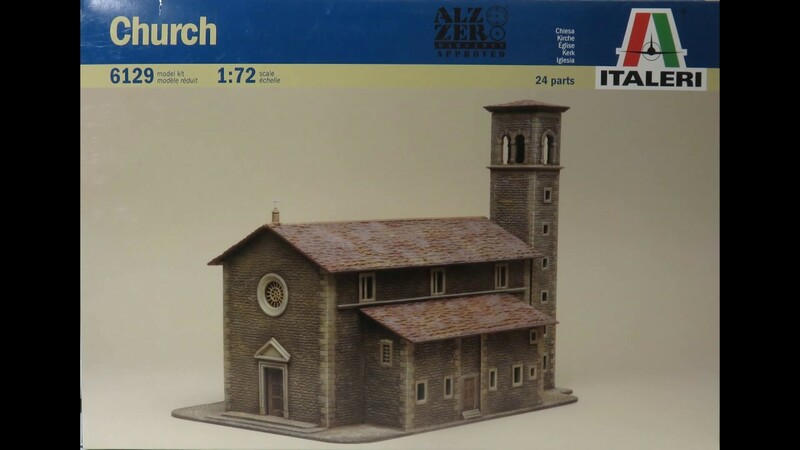 These buildings are PVC and are certainly 20mm in scale, certainly smaller then 4ground or Italeri but usable on the same table especially if the the 4ground and Italeri are used as isolated buildings and the Plastcraft are used in a town. They were quite difficult to assemble though and a little barren, I did try to do them up but somewhat unsuccessfully as you can see here. I recently bought the Empires of War MDF Normandy collection labeled as 20mm. As you can see below these are pretty small and I think probably should be labeled as 15mm but the larger buildings are OK with the Plastcraft. 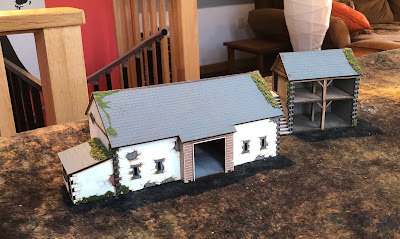 My final purchase was some Sarissa Precision World War 20mm buildings and I have to say they are nice. Not a big collection but I suspect true 20mm and fit well with the Plastcraft, the 4ground Café Grondée and the larger Empire at War buildings. But enough talking let's have a look. I set up the MDF buildings only as there is only so much table space. An unadorned Sarissa House-with a bit of work it came out as the below building on your right. The 4ground collection, the Café Grondée, is definitely smaller then the other 2 buildings and a little more flimsy. LtR: The smallest Empire of War, the 4ground Farmhouse, the Sarissa Chateau and the Café Grondé. I think you can see here that the 4ground Farm complex buildings are a little big! Anyway, I would be happy to hear about what else is out there in is this popular scale. I really like the Sarissa buildings. I think I would pick them over the others, but the choice is limited. I think I will get rid of the 3 of the Italeri buildings I do not like. The 4ground are quite expensive so I will keep them. The Empire of War buildings are OK especially the larger ones and are quite good value. Plastcraft good size but I found tough to assemble. Nice collection of buildings. For me durability, rather than adherence to a strict scale, is paramount. My buildings have to survive storage and handling and flimsy buildings just don't survive. I have a heavy dislike for the 4Ground stuff. To complicated a build for a Wargames piece and most easy to damage. Good to see the comparison. I like the Sarissa buildings, the design is well thought out, so they assemble well, often hiding the joins within the building features. I wasn’t aware of the Empires of War range, which don’t look too bad.